We all do stupid in our life and I get my share when I signed up for a March half-marathon when the temperatures were still ok in January, just two days before getting a fracture with multiple contusions (special injury combo!). At that time, this sounds easy and was hoping to run it fast and run it under 2 hours. 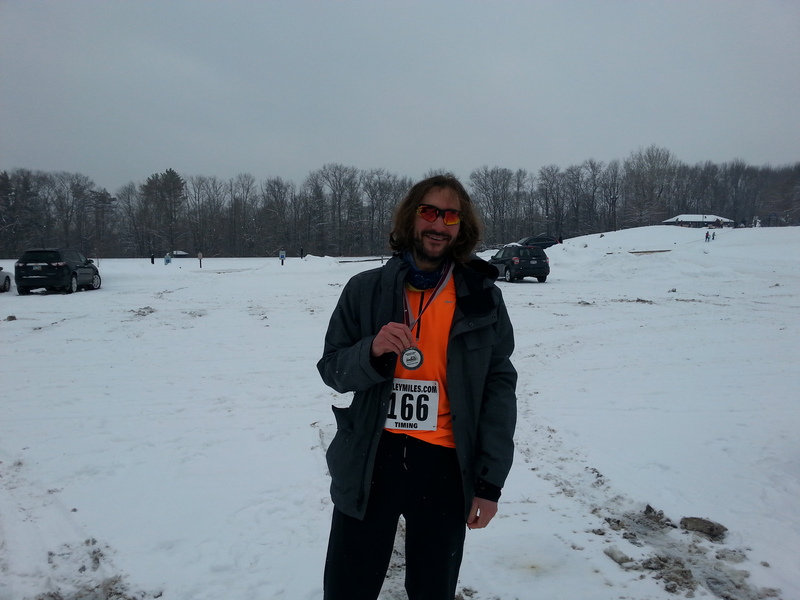 But after a serious injury and recovering for more than a month, what was a simple half-marathon became a challenging hilly/snowy post-injury race. The race is in Youngstown, Ohio and organized by the Youngstown Road Runners Club (YRRC). The race is very affordable ($30 with a tech-shirt and a post-race pasta dinner!) and all profits of the race support YRRC charities: YSU Cross Country Scholarship Endowment and a Shoe Program for High School runners in need. To get there from Pittsburgh, this is a 90 minutes drive. But with Snow Alert, this can take more than you expected. This was actually the case for this 2015 edition. So, if you plan to run this race, plan accordingly to be at the race site on time (race starts at 08:45). On my side, I drive safety and fast enough to be at the race site 5 minutes before the race. You have access to indoors (yaisse!!!) bathrooms before the race. Packet pickup is also indoor and the packet contain a long sleeve t-shirt and your bib. Nothing fancy, just what you really need. The entire course is scenic and beautiful. After not running outside for more than a month, this was exactly what I was looking for. 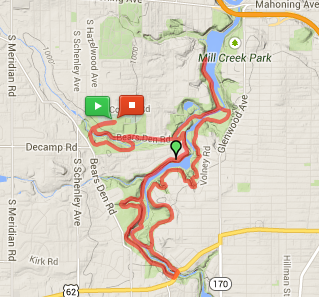 All the race takes place in the park and you run from one scenic area to the other. Tree are covered with snow, rivers seem to rest: this is the perfect environment for people who like nature. You must push more than expected. With the snow, you do not get as much traction as you expect so that it requires more efforts from your legs. In addition, these conditions make the downhill part hazardous. The course can be challenging if you are not used to running hills. There are about 19 hills (according to the race description). While they are not really though, they can be challenging in snowy conditions. For people used to steep hills (Pittsburgh runners anyone?) or on trails, this should not be an issue. You would highly recommend to use special assistance in case the course condition is hazardous. Putting screws on your shoe or using a Yaktrax would provide more traction (uphill) and stability (downhill) and potentially avoid falling! There are a lot of volunteers to check on you and give directions all along the course so that you cannot get lost and will get assistance if you get injured. Also, there was four (4) aid stations along the course, providing water and gatorade. Once you finish the race, you get a medal and can refuel indoors with different types of snacks (bagels, peanut butter, fruits, etc.). There is also a post-race pasta party (Penne with meatballs/tomato sauce) in a restaurant located few miles away from the course. It all depends on your objectives. If you are looking for a simple and easy race, forget it. The weather can make you miserable and the course condition will make you forgetting any desire of getting a PR. This is a challenging course, not because of its elevation (obviously, the hills are not so though) but because of the potential condition: going uphill in the snow require way more efforts and attention in snowy condition than on a sunny day. This can be exhausting and mentally challenging. On the other hand, if you are not obsessed with your time and love running in a scenic course, go for it: this is a cheap and wonderful race to try! Very scenic, especially with snow!